This meet is a Level 3 ASUSA / ATFUSA / World Para Athletics (WPA) Sanctioned Event. the 2019 Junior Nationals in Minnisota. IMPORTANT: Hotel reservations must be made no later than May 8th, 2019. The room block includes 25 rooms available on a first-come first-served basis. A credit card is needed to guarantee each reservation. A form of payment is required at time of check-in to cover all anticipated charges. Lodging arrangements are the responsibility of each team or individual athlete. provide the Group Code “TWA” to receive the discounted rate available through May 8th, 2019. The fees include registration, online registration service fee, lunch, meet sanctioning and qualification for the 2019 Adaptive Sports USA Junior National Championships. Online Registration must be completed by May 6, 2019 at 11:59 PM to avoid a late fee. A late fee of $50.00 will be assessed for each online registration between May 7 – 10 at 11:59 PM. Review the Tri-State Wheelchair & Ambulatory Games Packet document for the classification and eligible events details on Pages 5-8 and the Simply Register Online Registration instructions on Page 21 prior to start the online registration. The Tri-State Games LOC reserves the right to limit or cancel events based on enrollment as of May 11, 2019. Registrations will NOT be considered after May 11. Registration will NOT be available at the games. 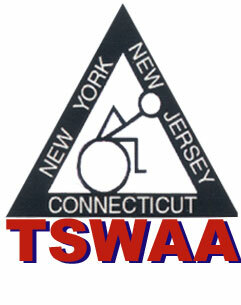 National classification at the Tri-State Wheelchair and Ambulatory Games will only be offered for track and field. All athletes in need of a National classification evaluation for track and field must fill out a National Medical Diagnostics Form . The National Medical Diagnostics Form does not need to be filled out by a doctor, but can be filled out by the athlete or parent who can give information on the athlete’s eligible impairment. One, it eliminates athletes who sign up for classification evaluation who are not eligible for competition. Two, it will assist the classifiers in preparing for the athletes who will be evaluated at the meet. The US Paralympics National Medical Diagnostics Form for Physical Impairment can be found in the Reg. Package (After the Simply Register Online Registration Instructions) . The complete form must be returned Bryce Boarman at bryce.boarman@usoc.org by Monday, May 6, 2019. The US Paralympics will review the form and then sent to the National classifiers that are working the Tri-State Wheelchair & Ambulatory Games event for review and determination of eligibility to receive a classification appointment. All athletes with a visual impairment that have not been classified must submit their medical forms to Bryce Boarman at bryce.boarman@usoc.org by Monday, May 6, 2019 to receive their national classification. This form must be completed by athlete's ophthalmologist. The US Paralympics National Medical Diagnostic Form for Visual Impairment CLICK HERE. Please send all completed forms to Bryce Boarman at bryce.boarman@usoc.org by Monday, May 6, 2019 or contact him if you have any questions regarding classification. Athletes can set Junior and Adult ATFUSA National Records in Track nd Field. There will be two track competitions; an Open Track event on Saturday, May 25 and another Track event on Sunday, May 26. The 5,000 meters Open event will take place on Saturday, May 26. All the athletes competing in the Open Track Event (Including the 5,000 meters event) on Saturday, May 26 must meet the defined qualifying standards. In addition, the Open Track competition will be limited to specific classes and track events.